Learn to identify other trees. Witch hazel is a must-have shrub for fragrance and color in the winter garden. At a time when few plants are blooming, witch hazel adds sparkle to the landscape with bunches of yellow to cream flowers. The four narrow, crinkled petals create a delicate, spidery appearance on the bare branches. This North american native is hardy in USDA zones 3-9. Flowers can be expected in early autumn in colder regions and later in more temperate areas. Witch hazel can be grown as a single or multi-stemmed shrub, reaching 12 to 20 feet high. It's form is vase-shaped, usually spreading 10 to 15 feet wide. New branches are slightly fuzzy and brown, turning silver-grey as they age. Coppery new growth in spring and attractive gold fall color rounds out this shrubs seasonal interest. Witch hazel prefers evenly moist, acidic soil but can adapt to a range of soil conditions. Grow in full sun to partial shade. In the wild it often grows as an understory shrub, at the edge of a bog or field. It is found in South eastern Canada, all US states east of the Mississippi, plus Texas and Oklahoma. 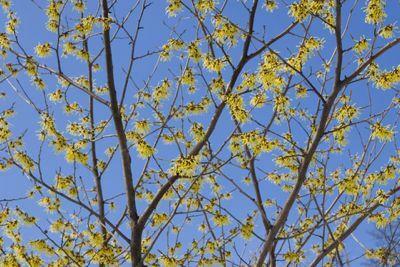 Reasonably care-free, witch hazel will grow into an attractive form with minimal pruning. Water regularily for the first year and during periods of extended drought after. It is rarely bothered by pests or diseases. Witch hazel can be planted in a mixed shrub border or used for height in the back of a perennial border. It is great as a transitional plant between tended gardens and wilder natural areas. It has high wildlife value, providing seeds for birds, rabbits and deer. While this plant is not deer resistant, it has evolved along side deer and browsing won't harm the plant, but can actually create a fuller shrub. Young plants can be protected with chicken wire. Consider planting witch hazel where you can enjoy the fragrance mid-winter, such as in an entry garden or near a path or patio. Pair it with ornamental grasses, winterberry (Ilex verticillata) and hellebores for interest throughout the winter. Witch hazel has been used for centuries to treat skin ailments. It is still a common ingredient in soaps, face washes and shampoos. One of the first commercially available skin care products in the United States was Pond's Extract, made from witch hazel. The origin of the name witch hazel is uncertain. It may have come from the Old English word 'wyche' meaning 'pliant', because the twigs bend easily. It is called hazel because it resembles the hazelnut shrub, though it is not closely related. Witch hazel is also associated with divining or dowsing for water, using a forked branch to locate underground springs. This was done with true hazel in Europe, and when settlers in North America found a similar looking plant, they used it for the same purpose. This species, hardy in zones 5-8, has larger flowers and leaves than the North American native. The shrub tends to be smaller though, from 10 to 15 feet tall. The flowers have a spicy fragrance. Crosses between Chinese and Japanese witch hazel have produced cultivars with a greater range of flower color. Hamamelis x intermedia 'Jelena' Red, gold and orange petals. Excellent red-orange fall color. Hamamelis x intermedia 'Diane' Coppery-red flowers. Hamamelis x intermedia 'Pallida' Pale yellow flowers, blooms early. Hamamelis Virginica - The Virginian Witch Hazel is really a beautiful hardy tree, and charming in October even in poor stiff soil.